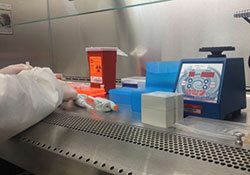 Film demonstrating safe practices in different laboratory settings. WHO/Europe organized BRM training in Tajikistan (2013) and Turkmenistan (2014). In Tajikistan, the BRM training supported a European Union and International Science and Technology Center (ISTC) initiative in central Asia to develop a training curriculum in biosafety for national and regional laboratories in Tajikistan. WHO/Europe attends meetings organized by partners and biosafety associations.